School disinfection service are part of a broad approach to preventing infectious diseases in schools. To help slow the spread of influenza (flu), the first line of defense is getting vaccinated. Other measures include covering coughs and sneezes, washing hands, and keeping sick people away from others. Below are tips on how to slow the spread of flu specifically through cleaning and disinfection, school disinfection. Cleaning removes germs, dirt, and impurities from surfaces or objects. Cleaning works by using soap (or detergent) and water to physically remove germs from surfaces. This process does not necessarily kill germs, but by removing them, it lowers their numbers and the risk of spreading infection. Disinfecting kills germs on surfaces or objects. Disinfecting works by using chemicals to kill germs on surfaces or objects. This process does not necessarily clean dirty surfaces or remove germs, but by killing germs on a surface after cleaning, it can further lower the risk of spreading infection. Follow your school’s standard procedures for routine cleaning and disinfecting. Typically, this means daily sanitizing surfaces and objects that are touched often, such as desks, counter tops, doorknobs, computer keyboards, hands-on learning items, faucet handles, phones, and toys. Some schools may also require daily disinfecting these items. Standard procedures often call for disinfecting specific areas of the school, like bathrooms. Immediately clean surfaces and objects that are visibly soiled. If surfaces or objects are soiled with body fluids or blood, use gloves and other standard precautions to avoid coming into contact with the fluid. Remove the spill, and then clean and disinfect the surface. It’s important to match your cleaning and disinfecting activities to the types of germs you want to remove or kill. Most studies have shown that the flu virus can live and potentially infect a person for only 2 to 8 hours after being deposited on a surface. Therefore, it is not necessary to close schools to clean or disinfect every surface in the building to slow the spread of flu. Also, if students and staff are dismissed because the school cannot function normally (e.g., high absenteeism during a flu outbreak), it is not necessary to do extra cleaning and disinfecting. Flu viruses are relatively fragile, so standard cleaning and disinfecting practices are sufficient to remove or kill them. Special cleaning and disinfecting processes, including wiping down walls and ceilings, frequently using room air deodorizers, and fumigating, are not necessary or recommended. These processes can irritate eyes, noses, throats, and skin; aggravate asthma; and cause other serious side effects. Always follow label directions on cleaning products and disinfectants. Wash surfaces with a general household cleaner to remove germs. Rinse with water, and follow with an EPA-registered disinfectant to kill germs. Read the label to make sure it states that EPA has approved the product for effectiveness against influenza A virus. to 1 gallon (16 cups) of water. • Apply the solution to the surface with a cloth. • Let it stand for 3 to 5 minutes. • Rinse the surface with clean water. If a surface is not visibly dirty, you can clean it with an EPA registered product that both cleans (removes germs) and disinfects (kills germs) instead. Be sure to read the label directions carefully, as there may be a separate procedure for using the product as a cleaner or as a disinfectant. Disinfection usually requires the product to remain on the surface for a certain period of time. they’ve been washed thoroughly. Wash your hands with soap and water after handling soiled dishes and laundry items. hands with soap and water after emptying waste baskets and touching used tissues and similar waste. 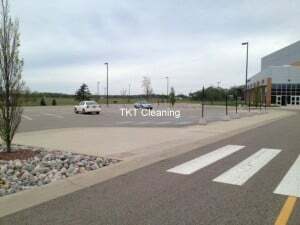 TKT school disinfection service help clean up school buses and disinfect school after cleaning. TKT cleaning offers daily housekeeping staff for the school, staff will implement the package hygiene, school disinfection periodically depending on the requirements of customers.